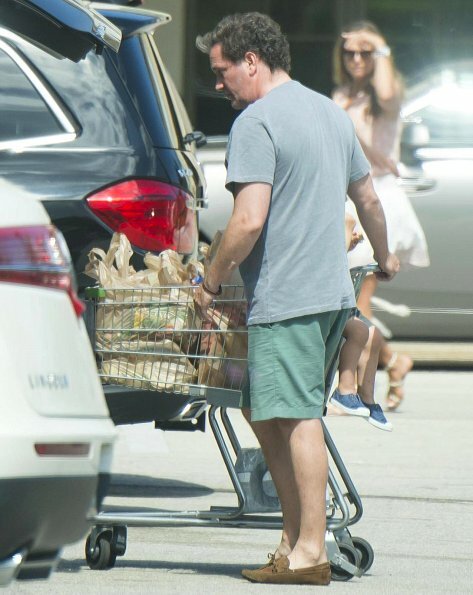 Princess Madeleine and her family, that is, Chris O'Neill, Princess Leonore and Prince Nicolas were seen during a supermarket shopping in Florida where they are having a holiday. Svensk Damtidning newspaper wrote that the family will return to Sweden in early June for the National Day based upon an interview made with the family last week. 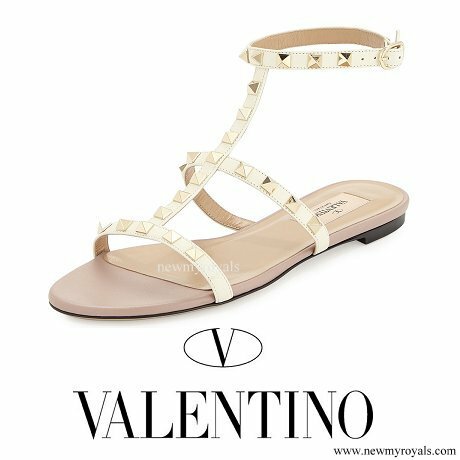 The outfit of Princess Madeleine: A skirt by Joie Shandon and sandals by Valentino Rockstud. Oh, les petits mollets de Chris... !!! She is a beautiful young mother who has her hands full with the tantrum of her little daughter, I guess. And she is angry about the paparazzi. But fashionwise this skirt does her not a favour. they are on holiday you expect her to wear couture !!! gosh!! beautiful woman very natural normal couple on holiday!! Poor little Leonore. This is exactly how I feel when I have to go grocery shopping! Its pretty weird how paps can find them even in Florida. Are they tracking their phones or something??? Okay, Madde looks still lovely, her hair look really beautiful. I'm surprised that Chris' hair are so curly-looking. Haven't noticed it before. ...and she also wore Valentino sunglasses, btw. I think this skirt is not very flattering because it makes her hips look wider but otherwise very classy look for casual style. These are presumably paparazzi photos, yes? I don't think they should be used. There is no legitimate public interest in a family doing their supermarket shopping - these photos are intrusive. They are not private persons. And they were photographed in public, no Paparazzi climbed upon a tree to photograph them in their garden. They must live with pictures like that. I disagree. This is a private family holiday and a trip to the supermarket. It is not in the public need to see them. It is very far from a public event. Chris declined a title or an official role in the Swedish royal family. Princess Caroline of Monaco sued successfully to stop these kinds of photos being taken of her and her family. Prince William is trying to do the same. But it is America in a very public supermarket parking lot. It could be a person shopping snapped w cell. Sold. I have no issue w these as it is a public place. I do have issue when they try to run them down or get in there way snapping pics. Or snapping into a pvt home or garden. But here? It is really kind of open season. They are from distance so its not like they were following them around. Some paps pics are just going happen. It becomes instrusive when it runs into their private space. Nah! These pictures were taken to remind everyone and we must not forget that Madeleine is the Shopping Princess. It is not about Chris with the groceries, it is not about Leonore throwing tantrums, it is not about them wearing unflattering clothes, the one and only message to put across is Madeleine- the Shopping Princess. There is something that I have observed. Leonore does not seem to like being photographed. I don't think she's having a meltdown, I think she saw the photographer and didn't like it, thus creating a scene. The photographers know where Chris's Florida house is. Cath, I don't care for paparazzi photos either. When it's an official event then we should see photos, otherwise it is an intrusion in their private lives. I do not want to give comments on a blog with paparazzi pics. So, goodbye Hellen Electra. And in English, dear! Thank you! I think those are nice pictures, very real, it shows them as they are not as posed like mannequins. I wish them a great holiday! I guess Chris is pi.... of, like: "Oh come on now, would you give me a hand here with all the bags, please? I don't want to spend all days long in the Supermarket! I'm on holdays!". And "She": "Yeah, I'm coming!! We have been on the toilet!!". I feel bad for them with Leonore, that girl always seems hyper, very stressful. When was the last photo she was sitting still? Must wear on a marriage. In any event, I think both parents look gorgeous. "That girl"?? your comment sounds so unkind towards a child. Pity. Cherry Blossom, what is unkind to say "that girl"? "americanmum" wrote first the name of little "Leonore". Her comment is her own opinion and it sounds completely o.k.. We all know how hard it can be for a Mum to handle hyperactive kids! Why is everybody so quick offended nowadays??? German-speakers are saying: "Nicht jedes Wort auf die Goldwaage legen!" Love and light to you.